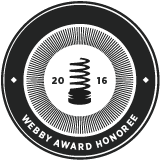 “6 Questions” was a 2016 Webby Awards Honoree in the Fashion and Beauty Category and FIT was the only school to be included in this category. With nearly 13,000 entries received from almost all 50 US states and 65 countries, the Official Honoree distinction is awarded to the top 20% of all work entered that exhibited remarkable achievement. KBP and the team at HUE Magazine were very honored to be recognized alongside large media companies such as PopSugar, Vice Media, and Refinery 29. Legendary New York nightlife impresario, Susanne Bartsch, is featured in this video produced for FIT’s HUE Magazine.